If you like to be on the water and the US President then you should check out this Donald Trump pool float. This is just a fun thing to have for the 4th of July celebration this year as this is a giant President Trump pool float. 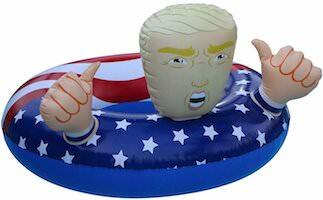 The pool float is round and 42 inches and it looks like a the American flag with two hands and the head of Donald Trump sticking up and that means that Trump can be living in your pool or can be fun to take to the beach. If you support your President and need a swim then a float like this is what you should be checking out.